Forty-one points. The game was approaching the three-minute mark, and UCLA was still stuck on 41 points. Now the Bruins led by two, 41-39, as Bruin point guard Cameron Dollar brought the ball up the floor. Dollar tossed it to Charles O'Bannon on the left wing; O'Bannon threw a soft pass to Kris Johnson at the elbow. Chris Doyal, the lone Princeton senior starter who was seriously thinking of quitting the team over the Christmas break because of Carril's constant berating  Carril called him "Mr. Flim-Flam," "social butterfly" and worse  sneaked up from bottom of the zone and picked it off. "I looked up and thought, 'Wow, that guy is going to throw the ball to the top,'" says Doyal, who bounced around the pro-basketball backwaters for years after graduation, suiting up for teams in Ireland and Mexico before settling into a finance job in London, where he now lives. "So I kind of stepped in there. My big regret is that I fumbled the ball. If I get a clean steal, I might have a dunk shot on national television." Instead, before losing the ball permanently  and perhaps earning the eternal enmity of Carril  Doyal shuffled it to Lewullis, as if it were a hot potato. Lewullis tossed it to Mitch Henderson, who charged down court for a three-on-one fast break. Henderson threw a bounce pass to Sydney Johnson, who banked in the layup. It may have been our first fast break of the season. Tie game. "Hooooold on!" Gus Johnson yelled on CBS. Those words, more than any other moment in the game, still give me goose bumps. UCLA panicked on the next possession, flittering the ball around the zone  Princeton almost stole it twice  before the Bruins' Toby Bailey rushed a three-pointer with six seconds left on the shot clock. The crowd was now firmly in a frenzy that would last the rest of the game. Bailey missed, Princeton rebounded and marched down the floor; with the shot clock again winding down, Lewullis fired a three from the right wing. No good. UCLA got the board and called time out with 1 min. 38 sec. to go. Out of the break, Bailey drove on the baseline, but Doyal took a charge, the third offensive foul he drew on the day. After each one, he put an arm in the air, as if he had won the Olympic decathlon. I asked Doyal why he was being such a buffoon. "The majority of the guys I guarded were bigger than me," says Doyal. "So I would try to do things that annoy them, and throw them off their game. And there's nothing worse than when you commit an offensive foul, to jump up and see a guy raising his arm, victorious." Princeton hadn't clinched anything yet; in fact, the next possession nearly cost the Tigers the game. Mitch Henderson and Sydney Johnson got mixed up on a pass: Dollar grabbed the loose ball, but Johnson bear-hugged him. Intentional foul: UCLA would get two foul shots, and possession. "At that point, I thought to myself, 'That's it. You guys are dead,'" says Matthew Henshon, a Princeton player from the early 1990s and future top aide to Senator Bill Bradley during the 2000 presidential campaign, who was sitting courtside, covering the game for Princeton's alumni magazine. To Sydney Johnson, the foul did not destroy Princeton's dream. "You are stunned, everyone is stunned," Johnson says. "I felt a little bad, yeah, but it was one of moments in a game where you make a mistake, but it doesn't do much benefit to dwell on it." Dollar stepped to the line, prepared to finally put Princeton away. He missed the first one. "You're like, 'Oh,'" says Sydney Johnson. He front-rimmed the second. "You're like, 'Wow.' The crowd is into it. Next play." UCLA still had the ball, but Kris Johnson missed a runner in the lane. Goodrich cradled the rebound. Princeton called time-out, with 21 seconds left. Everyone knew what was coming next. Recalling how he was open at the end of the first half, Lewullis yelled "center forward, center forward"  the name of the play Princeton called at that point in the game  to everyone in earshot as he ran off the floor for the time-out. The coaching staff huddled. "I think we all said, 'center forward' at the same time," says John Thompson III, the Georgetown coach. Often, the assistants threw different options at Carril. This time, the call was easy. "In some of those time-out huddles, things weren't always too clear," says Joe Scott, another Carril assistant, who became Princeton head coach from 2004 to '07 and is now the head coach at the University of Denver. "There was a calm and clarity among the coaches, and that really transcends down to the players." In the UCLA huddle, the advice was simple: watch the backdoor. Even though Carril was asking this green freshman to hit the winning shot, against the national champions, on national television, Lewullis stayed calm as Johnson dribbled up the court. "We ran the offense so much in practice, I knew what to do," says Lewullis. "It was just another play. But I did think, 'Don't screw up so that Carril yells at you.'" Goodrich ran up to the high post, then back to the low post, before setting up at the elbow; Johnson bounced him the ball with 8.7 seconds. Johnson and Doyal set up a double screen for Henderson, but Mitch Henderson, like everyone else, fixed his eyes on the right side of the floor. There, Lewullis made his first cut to the basket. O'Bannon didn't fall for it. "I'm there," thought O'Bannon. "'I got this. I got this." Lewullis ambled back out to the wing, trying to lull O'Bannon to sleep, for that split second. Goodrich gave the perfunctory look to the other side, before taking a dribble toward Lewullis. Then Lewullis cut again. The Princeton bench, knowing what was coming, rose like a wave. Goodrich did not hesitate on the pass. "You're really worried when the defender's hands are low," says Goodrich. "When that happens, he can go down for it. But O'Bannon was pretty upright. Gabe [Lewullis] had pretty much beat the guy. So it was never, 'Oooooh, what do I do now?'" Lewullis caught the ball. "I can see it right now," says O'Bannon. "It just got by my fingertips." Lewullis jumped off two feet; Kris Johnson, knowing O'Bannon was beat, dropped down the lane and went for the block. "I jumped as high as I could, man, and felt that thing graze off my fingernail," says Johnson. "I felt it. I mean I felt it. I felt it. I thought I had it. If I could just jump a little higher, a little higher, history could have been rewritten." "He got it! He got it!" shouted Gus Johnson. "Ohhhhh yes!" Buckner yelled at the same time. "To this day, I don't know how Gabe didn't get his shot blocked," says Doyal. "He jumped an inch off the ground, and Charles O'Bannon had about a 45-in. vertical. So he shot it over two guys while going an inch off the ground. To Gabe's credit, it's awfully easy to miss that shot." But four seconds remained. 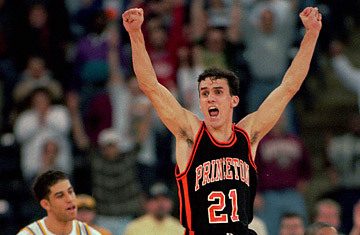 Dollar rushed up the court, and the name Tyus Edney popped into several Princeton brains. The prior year Edney, a UCLA guard, dribbled the length of the court and hit a layup in 4.8 seconds, giving UCLA a second-round victory over Missouri on its way to the title. However, a ref blew his whistle, and play suddenly stopped. Mass confusion ensued: did UCLA call a time-out? Where should they get the ball on the sidelines? How much time should be on the clock? UCLA had, in fact, called time-out, but the ensuing seven-minute delay felt like seven hours. "Play the f---ing game!" thought Doyl Burkett, the Princeton sophomore in the stands. "I was literally a nail biter at that time," says Burkett. "I was the stereotypical nervous guy with the furrowed brow. I was very conscious of that: just gnawing, gnawing." Play finally resumed, and UCLA got the ball on the sidelines, in front of half-court, with 2.2 seconds left. The placement was actually a gift to the Bruins, because Dollar hadn't advanced that far up the court when the whistle blew. Would Carril, sitting on the bench in his wrinkled gray sweater, hand cupping his head like he was expecting disaster, be tortured once again? But the Princeton assistants acutely scouted UCLA's out-of-bounds play, and the Bruins followed the script, getting the ball to Bailey in the right corner. Johnson was there to pressure the shot: Bailey fired an air ball. "Oh!" shouted Gus Johnson. "They beat 'em!"